Benh Zeitlin's BEASTS OF THE SOUTHERN WILD, a magical-realist indie drama set in the post-Katrina southern Louisiana bayou, has been lavished with critical praise. “One of the most auspicious American directorial debuts in years,” raved the Toronto Globe and Mail's Liam Lacey. The film won the Palm D'Or at Cannes and a top prize at Sundance. It is certainly an impressive film, and original enough to merit admiration. Using a cast of non-professional actors and sets built by cast and crew, Zeitlin has created an original experience and, most memorably, an unusual heroine in Hushpuppy, the wild-haired tomboy played with gritty intensity by newcomer Quvenzhané Wallis. The film's strength, however, lies more in its aesthetics than its narrative, which is less than completely satisfying. The story is loosely based on a play by co-scenarist Lucy Alibar. It centers on six-year-old Hushpuppy, who lives in squalid conditions in a place they call “The Bathtub” – modeled on the Isle de Jean Charles – with her irascible father, Wink (Dwight Henry). She evokes her mother, who "swam away," by talking to an old discarded basketball jersey (LeBron's No. 23, I believe -- so that's where those went). The Bathtub is portrayed as a kind of primitive utopia, where the inhabitants drink, laugh, celebrate and eat crawfish with their hands while chanting “Beast it! Beast it!” Hushpuppy has a rough, Huck Finn quality – at one point, Wink exhorts her to flex her muscular little arms: “Show me your guns!” Later, we see her unwillingly outfitted in a little girl's dress with a lace collar, and it looks somehow wrong. A coming storm threatens the existence of The Bathtub residents' ramshackle idyll. 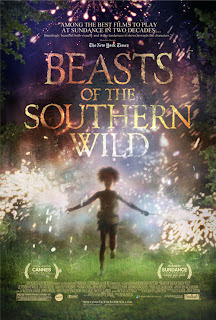 A teacher warns Hushpuppy and the island's other children about the impending climate disaster that will melt the icecaps, unleashing from the glaciers herds of aurochs, fierce, extinct bisons that in this film are a metaphor for the forces of inexorable change that Hushpuppy must combat. Her point of view, improbably mature and philosophical, is presented in voice-over narration. “The whole universe depends on everything fitting together just right,” she says, like a Tao master. Echoing the story of the Katrina floods, BEASTS celebrates the idea of self-sufficiency, as the Bathtub residents resist ordinary society's attempts to get them to vacate the dangerous flood area. “Daddy says brave men don't run from their home,” Hushpuppy says in narration. The movie's marriage of folklore – the special-effects aurochs that move through the landscape – and the realistic story of a poor but proud Bayou family – is not an entirely happy one. The human story is drowned in the floodwaters of Zeitlin's folkloric impulse. The story of a motherless little girl whose father is dying, and the stories of poor people whose lives are wrecked by disasters like Katrina, should be poignant, yet here it is curiously unmoving. The problem is that these are not human characters, just literary conceits. Still, there is much to embrace in BEASTS OF THE SOUTHERN WILD: the originality of its concept, the textured, painterly cinematography of Ben Richardson, the unsentimental portrait of poor, hardscrabble lives, and above all, a remarkable young heroine in Quvenzhané Wallis' Hushpuppy. 3 out of 4 stars.